The Ring Floodlight Cam mounts where a traditional floodlight would be installed, and protects your property around the clock with a built in HD video camera, LED floodlights, two way voice and built in 110dB siren. 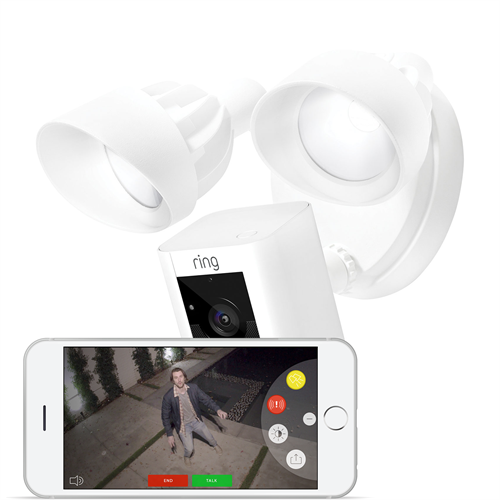 A motion activated high definition video camera sends an alert to your smart phone when motion is detected and lets you see what's happening with the free cloud service. Two way audio allows you to hear what's happening and you'll be able to talk back as well. The camera's motion detection area can be customized and can be set to alert you only when people are present, by using facial detection. A pair of LED flood lights are built in and will turn on based on motion - or you can use the app to turn them on remotely any time. You can even flash them to scare away an intruder. The floodlights are activated by a separate motion sensor with 240 degree wide angle coverage. The flood light motion sensor can be turned on or off separately from the camera's sensor. If that's not enough, a loud built in 110dB siren can also be triggereed remotely from your app to turn away the bad guys. Live video is always free, with optional paid cloud recording and storage available for one or multiple cameras. Set up for remote access is simple without any fancy IP network settings required. 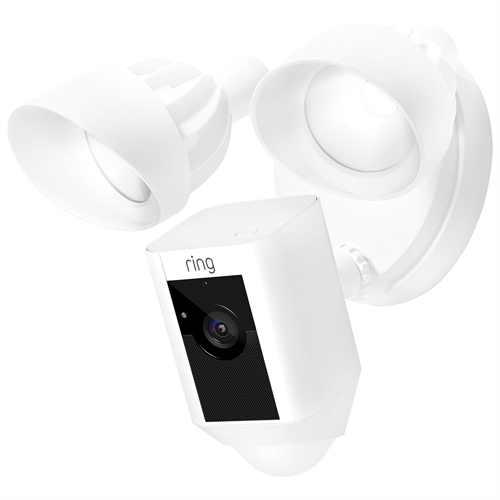 See Ring's site for cloud recording plan details. Note: Please ensure you have a strong WiFi signal where the Floodlight Cam will be mounted. Your Internet connection must have adequate bandwidth, around 1Mb/s upload speed. The floodlight mounts to a junction box and requires 110VAC-240VAC power to operate.